CONCORD — Nawada Landscape Design, Inc. The design employs a series of areas within the landscape providing a harmonious connection between the house and the gardens. 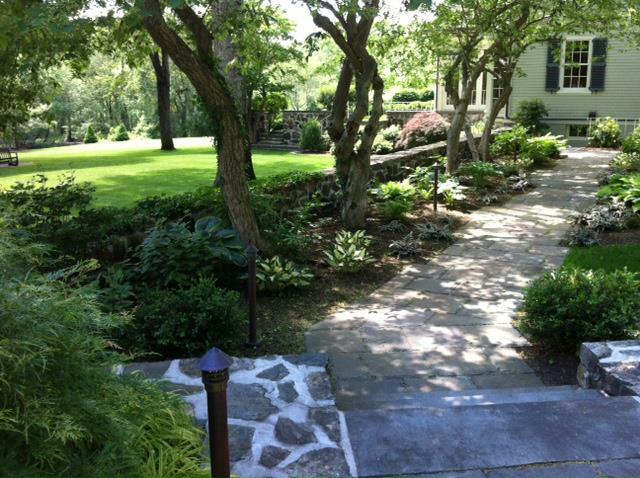 Rustic bluestone walkways were created to link the house and the pool area. The path meanders through the perennial shade gardens and opens up to the outdoor living space surrounding the pool. Ornamental grasses and sun loving perennials replaced the existing broadleaf evergreens and create a backdrop along the new pool fence. Low voltage lighting was designed and installed to create a nightscape among the plants and paths. The solid copper and brass fixtures provide the following functions: Path Lights & Bollards to illuminate walkways, In-Grade Lights to wash the vertical fence line, Down Lights mounted in trees to create contrast on the pool deck and Directional Lighting to cast subdued light on grasses and shrubs. Front foundation plantings were selected to thrive in morning light and deter deer from grazing.